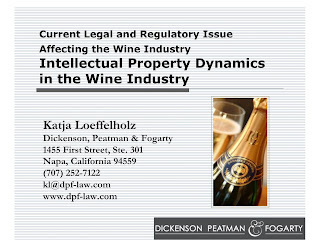 The presentation provides an introduction and overview of trademark law as it specifically applies to the wine industry. It includes several examples of what aspects of a wine label, bottles and packaging can be protected. In addition to trademarks, other things closely associated with brands — such as slogans, colors, specific product features, designs and bottle configurations — are protectable assets. In addition, Ms. Loeffelholz’s presentation addresses what makes a strong mark; adopting and clearing a brand; trademark registration; enforcing your intellectual property rights; and how copyright in label designs and design patents in bottle shapes create additional brand equity. The presentation also points out various pitfalls wine industry clients encounter in selecting and protecting their brand, and how to avoid them. For more information on trademark or patent matters, please contact Katja Loeffelholz at kl@dpf-law.com.